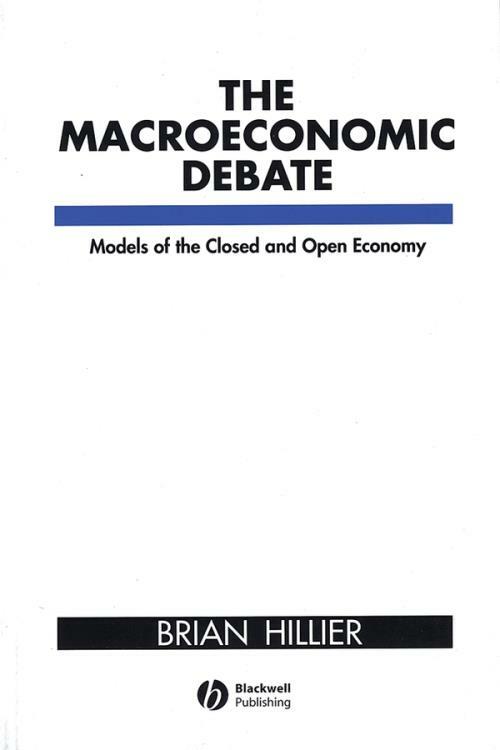 This textbook, originally published as Macroeconomics: Models, Debates and Developments, enables readers to understand the current debate amongst macroeconomists by examining the major theoretical controversies that have raged in macroeconomics since the publication of Keynes′General Theory.In a clear and concise style, Brian Hillier uses simple macroeconomic models to show how the controversies have led to the development of new ideas and further debate. The key issues fought over today by New Classical, New Keynesian and Monetarist economists are shown to have their roots in the debate between Keynes and the Classics. For this new edition, the author has increased the space given to open economy models to show how the closed economy models developed earlier in the book can be developed earlier in the book can be developed to deal with important open economy issues. Topics covered include Keynes versus the Classics; does fiscal policy really matter? ; is there a trade–off between inflation and unemployment? ; and can the government maintain the exchange rate without losing control of fiscal and monetary policy? Part I: Keynes versus the Classics: Will Money–Wage Cuts Remove Unemployment?. Part II: Was Keynes′s General Theory Simply a Special Case of the Classical Model?. 3. Special cases of the IS–LM Model and the Neoclassical Synthesis. 4. The Re–interpretation of Keynes. Part III: Does Fiscal Policy Really Matter? The Crowding–out Debate:. 5. Wealth Effects and the Government Budget Identity. Part IV: Inflation and Unemployment: Is there a Trade–off?. Part V: Does Macroeconomic Policy Really Matter?. 7. The New Classical Macroeconomics: An Introduction. 8. The New Classical Macroeconomics: Some Responses. Part VI: The Open Economy: The Consequences of Exchange Rate Regimes for Domestic Stabilization:. 9. The Open Economy: An Introduction. 10. The IS–LM Model of a Small Open Economy. 11. Stock–flow Equilibrium in the Open Economy. 12. Prices, Exchange Rates and Policy.